One poor dog was forced to choose between facing its fears or abandoning walkies. A dog owner captured the adorable moment his husky was too terrified to walk down the stairs - with a hilarious outcome. The comical video shows the Siberian Husky in a spot of bother, having made its way up the stairs but then finding itself unable to go back down again. The dog walks in circles around the room - even hiding behind a desk chair - in a bid to avoid making its way down the stairs. Howling and whining, the poor dog is firmly convinced that any step it takes could have terrible consequences. Its owner videos the husky in a pickle after it realises it is too afraid to face the daunting task of going back down the looming staircase. The owner tries to coax the dog down with the prospect of going for a walk, but the stubborn pet refuses to move. The hilarious exchange between the dog and owner goes on for several moments, with the two almost appearing to have a conversation. Each time the owner tries to lure his pet down the stairs, the dog whines. It even stubbornly grunts towards the end - seemingly putting an end to the debacle. By the end of the video, the husky simply lays down, looks at its owner, and refuses to move. 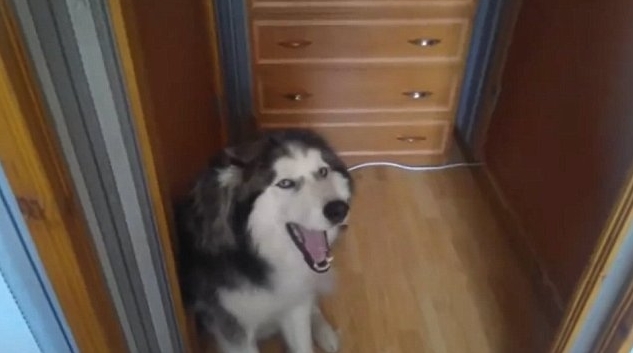 Responses to "Adorable Talking Siberian Husky Refusing To Go Down Stairs"
he is clearly saying "I don't want to"
Thats a Malamute not a Husky!